Let's say it outright: it's gonna be a painful but very satisfying experience. 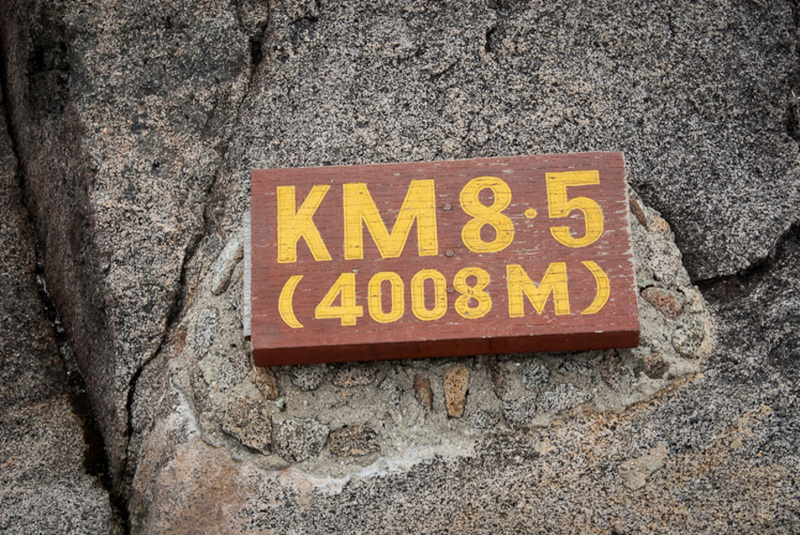 At 4095m (13,435ft), Mount Kinabalu is the highest mountain in Malaysia. 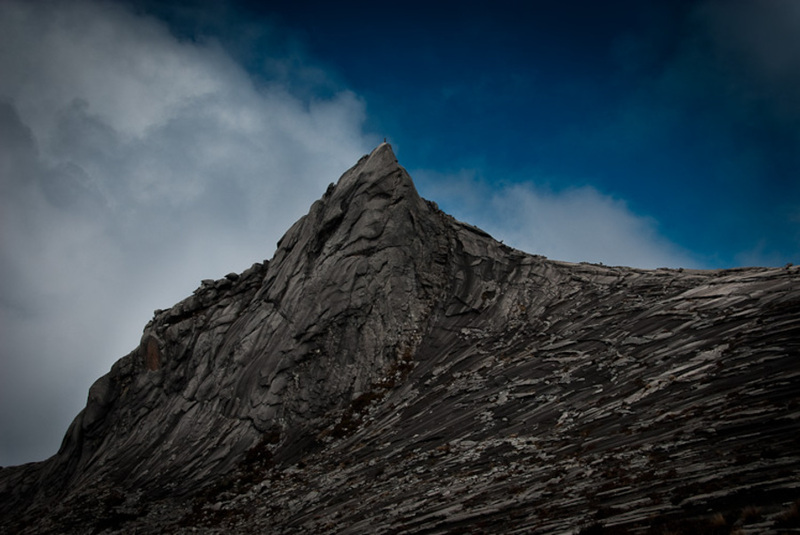 This majestic giant overlooks Kinabalu National Park, which is located about 90km north of the city of Kota Kinabalu. 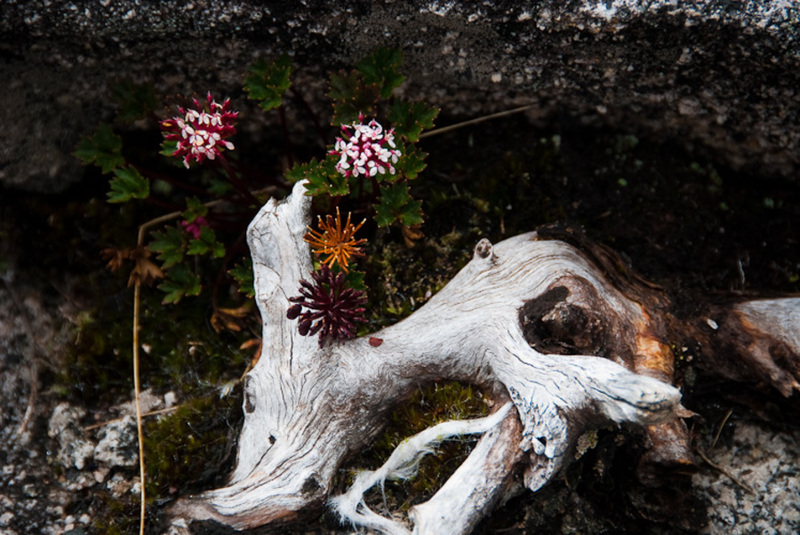 The park itself is rated as a UNESCO world heritage site because of its extreme biodiversity. Some of the species found here cannot be seen anywhere else in the world, and if you're lucky you'll catch a glimpse of the famous rafflesia: the world's largest flower. The mountain is very popular with tourists as the climb itself is very scenic, and no special mountaineering skills are necessary to make it to the summit. You start in lush green forests and as you go the vegetation gets more and more sparse till you walk on granite for the last few kilometers. 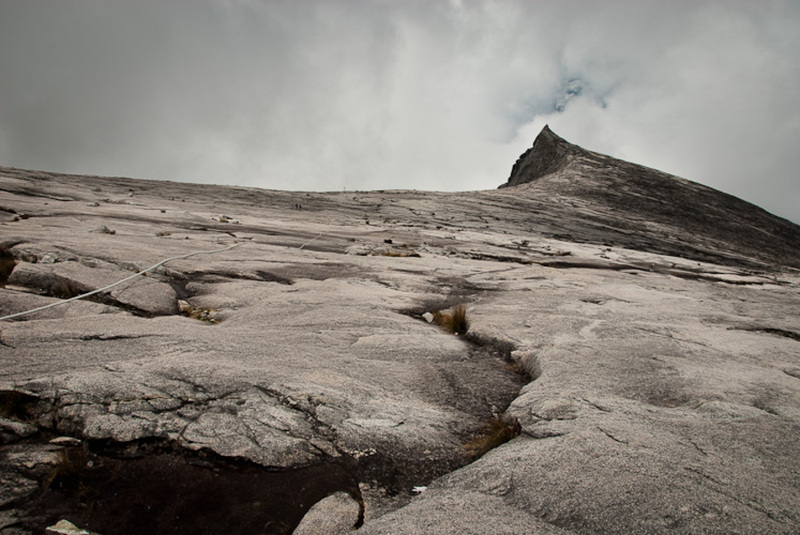 There is a annual speed climbing competition on Mount Kinabalu. The record is held by Agusti Roc Amador of Spain, who did the whole climb in incredible 2 hours and 44 minutes. The fastest lady, Favre Corinne of France, did the trail in 3:17hrs. The local guides, who are not happy about the fact that two foreigners are holding the records, claim that a special chicken diet is responsible. It will take 2 days to finish the whole hike. There are 2 different starting points. The first one is at the park headquarters from where you'll need to hike along a road to the Timpohon shelter. This saves you a few ringgit for the shuttle bus but is not the recommended route. Almost all the climbers will take the bus and actually start their hike at the Timpohon shelter. On the first day you need to leave at around 11am and hike about one quarter of the whole distance. 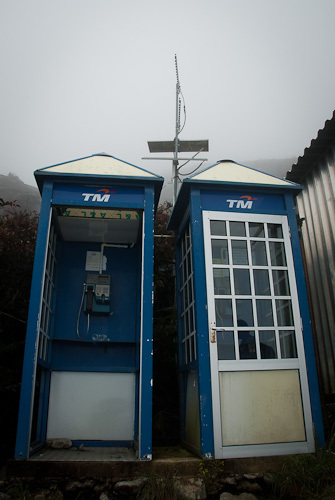 Depending on your speed, you'll reach the Laban Rata rest house, 3272m along the route, in 3-6 hours. 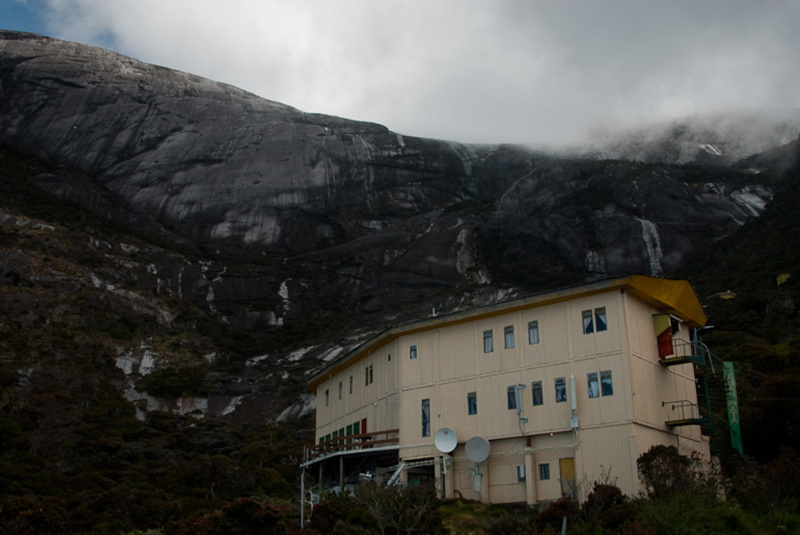 Laban Rata, or the smaller shelters around it, will be your accommodation for the night. In case a 1406m vertical ascent wasn't tiring enough for you, a volleyball field is provided. For those who want to see the sunrise on the summit, the second day will start at about 2-3am. Conveniently you can leave your luggage at the shelter which makes climbing much easier. 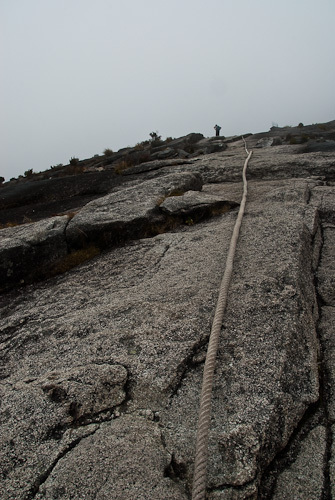 Most of the remaining path to the summit is on stone ground along ropes which are mainly for guidance and are necessary only in a few places for actual climbing support. Once you stand on the summit you will know why you did this to yourself. A gorgeous view and hundreds of sunrise pictures will be your reward. The breakfast buffet at Laban Rata will strengthen you for the remaining descent. It is highly recommended to book accommodation on the mountain months in advance as it tends to be fully booked over long periods of time. In case you cannot get accommodation the only chance to do the hike is a day trip, as camping on the mountain is not permitted. Every day there are only 4 day trip spots available. You need to check in at the park headquarters where the rangers try to ensure that you are in the physical condition to do the hike in one day. It is only recommended to do the day trip if you have no health issues, a general fit condition and some mountaineering experience. The day trip starts at 7am at the headquarters, walking to Timpohon shelter is not an option as it takes too much time. It is only allowed to do this with a guide and you need to make it to the summit before 1pm. The big advantage of the day trip is that you'll save accommodation costs and you'll get to hike in a smaller group. You need some special gear for the mountain which you usually don't need while traveling in Malaysia. Firstly, some solid hiking boots and rain gear. A flashlight and a warm jacket are recommended for those who want to do the sunrise ascent. Don't forget to bring sunscreen too, as the sun is stronger at higher altitudes. This incredible experience comes with a cost, and the 2 day trip is not cheap. There are the park fees which are RM100 for non-Malaysians and RM30 for Malaysians. The shuttle bus to Timpohon shelter is about RM30. Fees for the guides start at RM85 and increase with the size of the group. There is a RM7 insurance fee and last but not least the dormitory bed at Laban Rata starts at RM300 a night.